Tasting a good wine is one of the greatest pleasures in life but the flavor of this delicious drink is easily influenced by the external environment. One of the main mistakes made by many wine lovers is not storing the bottles of wine at the right temperature. However, preserving the wine at the right temperature is not as hard as you may think, and in most of the cases, you don’t even need to have a wine cellar. What you need is a convenient household appliance, namely a wine cooler. On the market, there is a myriad of wine coolers available. Some of them have different functions, others are more similar to the mini bars, and some even boast splendid aesthetics so you can use them as home décor objects as well. In this article, we are going to talk about the versatile dual zone wine coolers, explaining the characteristics of this useful device and why you should buy one. 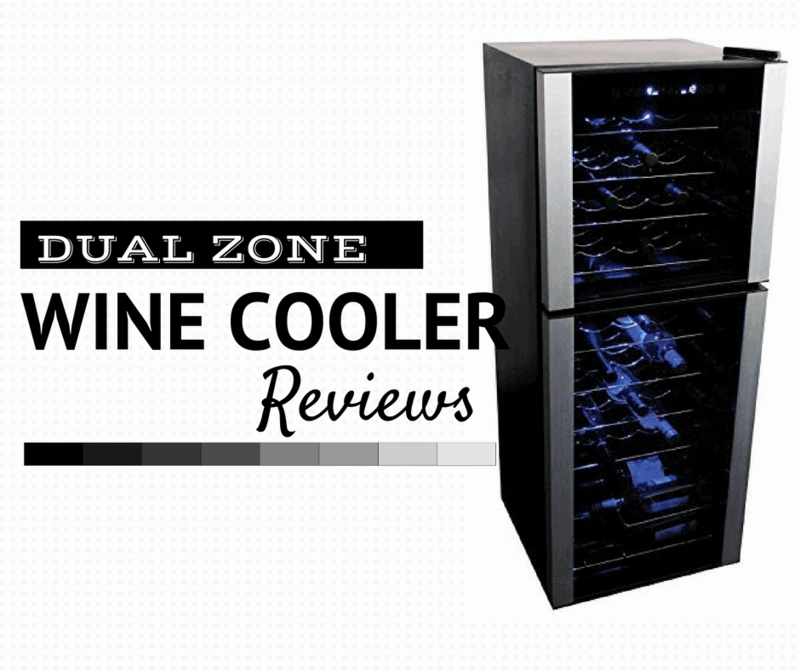 We also put up a list of the most popular dual zone wine cooler reviews to help you choose your favorite. So keep reading. Is A Dual Zone Wine Cooler Right For You? How To Choose A Dual Zone Wine Cooler? If you are a wine hobbyist, or if you like to make your own wine and plan on serving it to connoisseurs, a wine cooler is an essential appliance to have. A wine cooler will allow you to keep your precious drink at the right temperature and humidity, so its characteristics will not be altered by any environmental factors. The main question that arises, especially among the newbies, is why should you buy a wine cooler when you could simply use a fridge to store your wine. Well, the answer is simple. A wine cooler is an appliance designed specifically for wine, it has different characteristics compared to a regular refrigerator and can provide different temperatures that are ideal for preserving or cooling wine before a tasting session. Special shelves: the wine cooler, unlike the traditional fridges, has special shelves designed specifically to accommodate wine. Typically they are made of wood, although many modern coolers have metallic shelves, but they are all designed to let the air to circulate. Custom ventilation system: in addition to a proper air flow, the constant humidity is an essential element in the well-preserving of the wine. The wine coolers have special ventilation systems that maintain the right level of humidity. Tempered UV-shielded glass: the glass doors of the wine coolers are typically made of double or triple tempered anti-UV glass that will keep your wine safe from any light damage. You will need this feature especially if you want to store white or sparkling wine. Anti-vibration cooling systems: since the bottles of wine shouldn’t be moved until tasting, the wine coolers are equipped with anti-vibration cooling systems that are designed to prevent any damage to the bottles. As it is difficult to find all these characteristics in a regular refrigerator, it is quite clear why you should invest in a wine cooler. Let’s see which are the types of wine coolers you can choose from. Basically, we can classify the wine coolers based on the cooling system or based on their structure. In the first case, the wine coolers can be divided into two categories, compressor wine coolers and thermoelectric wine coolers. The compressor wine coolers use the same cooling technology as a normal refrigerator, that is based on compressing the air and then release it to reduce the internal temperature. These wine coolers are equipped with built-in thermostats that start the cooling system each time the temperature starts to rise. You can place a compressor wine cooler pretty much anywhere in the house, paying attention to leave some space between the back of the cooler and the wall, to ensure a proper ventilation. The thermoelectric ﻿﻿﻿wine ﻿﻿﻿coolers use the electric current to reach and maintain the desired temperature. These devices actually use a metal rod that transports the heat outside of the system, keeping the temperature low on the inside. For a proper functioning, you will have to keep both the back and the sides of the cooler at a distance from walls or other pieces of furniture. Based on the structure of the wine coolers, there are single zone and dual zone wine coolers.The single zone wine coolers maintain the same temperature inside the whole internal space and are the preferred choice of the novices in the world of wine keeping. The dual zone wine coolers can provide two temperatures that can be set to preserve different types of wine, or to preserve wine and to cool it before serving. Because the different wines should be kept at different temperatures, you might decide that a dual zone wine cooler is a more appropriate investment. Let’s see which are the right temperatures to preserve wine. Depending on the type of wine you have, you should preserve it at the right temperature between 50 and 59 degrees Fahrenheit. White wines should be preserved at temperatures between 50 and 54°F.This is also the ideal temperature for the most sparkling wines. Red wines, on the other hand, should be preserved at temperatures 54 and 59°F. If your collection of wines comprises both white or sparkling and red wines, the best thing to do is to maintain the temperature at around 54°F. The desired humidity, in both cases, is about 70%. If variations between 60 and 80% will not alter the quality of your wine, you should pay attention to stay within these parameters at all times. Well, the answer to this question is tricky. Basically, unless you are a true connoisseur of wines, or unless you own a wine business, you probably don’t really need a dual zone wine cooler. However, if you are a wine lover and you want to make sure that you preserve the different types of wine at the right temperature, then a dual zone wine cooler is an essential appliance. But a dual zone wine cooler is more versatile than this. A dual zone wine cooler will let you maintain the desired temperature to preserve the wine in one part of the cooler and a lower temperature to cool your wine before serving in another part of the cooler. For this reason, even if you might not need a dual zone wine cooler, you can still take advantage of this awesome characteristic. The first thing to determine when choosing a dual zone wine cooler is whether you want to invest in a compressor or in a thermoelectric appliance. Once you decided this, based on how large your wine collection is, you should determine the size of the cooler.Depending on your real necessities, you should be able to determine the right size for you. However, remember that you shouldn’t store the wine in a wine cooler for longer than a year. Another important aspect to determine is where you want to place the wine cooler. On the market, there are built-in wine coolers that can be included in your furniture. You could also choose a freestanding wine cooler, which has the design very similar to a refrigerator. If you want to place the wine cooler in the living room or in the studio, some manufacturers have some beautiful models of wine coolers made of wood or other noble materials that are beautiful pieces of furniture. One of the most popular dual zone wine coolers on the market is the spacious Kalamera Freestanding Wine Refrigerator that provides enough storage space for up to 157 wine bottles. However, if you don’t have such a wide collection or if you don’t want to invest a high amount of money in a wine cooler, Kalamera manufactures the same appliance for 30 or for 46 bottles. You can also decide if you want to use this wine cooler to preserve both red and white wines or if you want to use half of the device to preserve wine and the other half to cool the wine before serving. The upper zone cools down to temperatures ranging between 40 and 50°F, while the lower zone will keep your wines at temperatures between 50 and 66°F. Triple-layered tempered glass door: you will be able to show your collection of wines to your guests without worrying about the light ruining the liquor thanks to the triple-layered glass door. Versatile installation: you can choose to use this wine cooler as a freestanding refrigerator anywhere in your house, or to build it in the furniture. Sophisticated design: provided with a soft blue LED light and elegant wooden shelves, this wine cooler will give an extra touch of class to any interior. 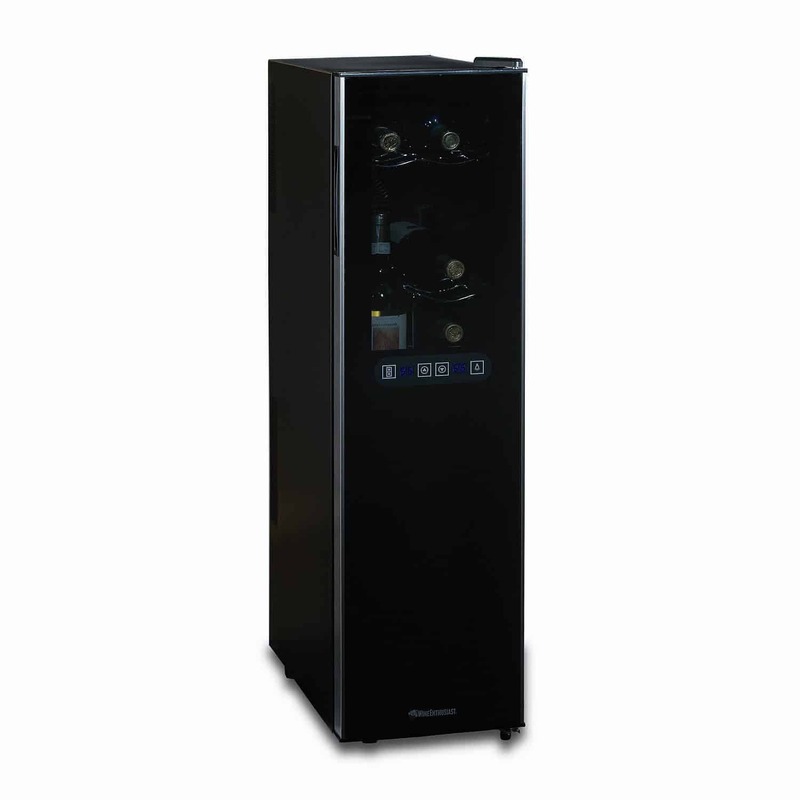 Low level of noise and vibration: although it is a compressor wine cooler, this unit is extremely silent and has a very low level of vibrations. It seems that the capacity is a little lower than the one stated by the manufacturer. However, you will still be able to store many regular size bottles. A beautiful dual zone wine cooler, perfect to keep up to 18 bottles of wine, this Wine Enthusiast wine cooler impresses with its sleek design that can match any interior. Built as a freestanding unit, this wine cooler is compact enough to fit easily even in the tighter or narrower places. One of the greatest features of this wine cooler is the upright bottle storage space, that will allow you to keep cool a wine bottle that is already opened. The temperature zones are ideal for the preservation of both red and white wines, being divided into a 10-bottle zone with temperatures between 54 and 66°F and an 8-bottle zone with temperatures between 46 and 66°F. Thermoelectric wine cooler: this wine cooler is silent and produces almost zero vibrations thanks to the thermoelectric cooling technology. Touchscreen commands: you will be able to set the desired temperature easily, thanks to the modern touchscreen commands. Upright bottle storage: ideal to keep an opened bottle at the right temperature. Elegant: this wine cooler can enhance any type of interior thanks to its beautiful design. The bottom zone of the wine cooler doesn’t have any light, and the unit might not be suitable for the large bottles. Another popular dual zone wine cooler is the Koolatron 45 Bottle Dual Zone Wine Cellar. 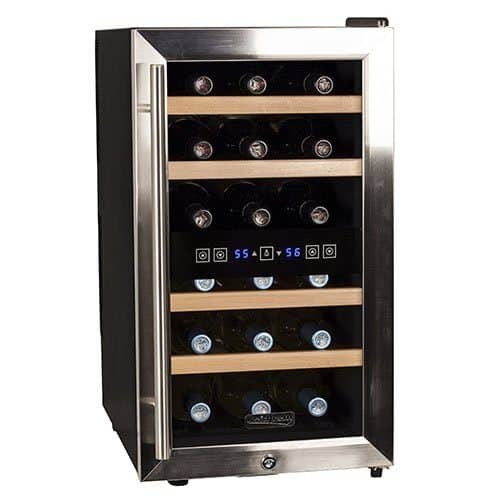 As the name says, the unit can hold up to 45 wine bottles at a time, while the cooler is actually divided into two separate zones, each with its own door. The aspect of this compressor wine cooler is modern and sleek, being enhanced by the aluminum details. The doors are made of dark tempered glass and your collection of wines will simply glow in the soft blue light. The wine shelves are made of metal and are very slim, occupying very little space inside the cooler and a useful basket placed on the bottom will allow you to store even more wine bottles. A LED display will let you set and control the temperature in both compartments, that can vary between 45 and 54°F in the upper zone and between 54 and 65°F in the lower zone. Removable shelves: you will be able to remove or to change the position of the shelves to accommodate any types of wine bottles, including the larger ones. Temperature display in Celsius or Fahrenheit: you will be able to set the right temperature even if the label of the wine uses another metric unit for the temperature. Digital control: the temperature control is digital, being easy to set or change the internal temperature of both zones. Compressor wine cooler: you can be sure that your wines will stay at the desired temperature regardless of the external conditions. Being a compressor wine cooler, the unit is pretty noisy when the cooling system is running. A small and rather economical solution for all those wine enthusiasts who are just beginning to form a collection of wines is the Haier 12-bottle dual zone wine cellar. 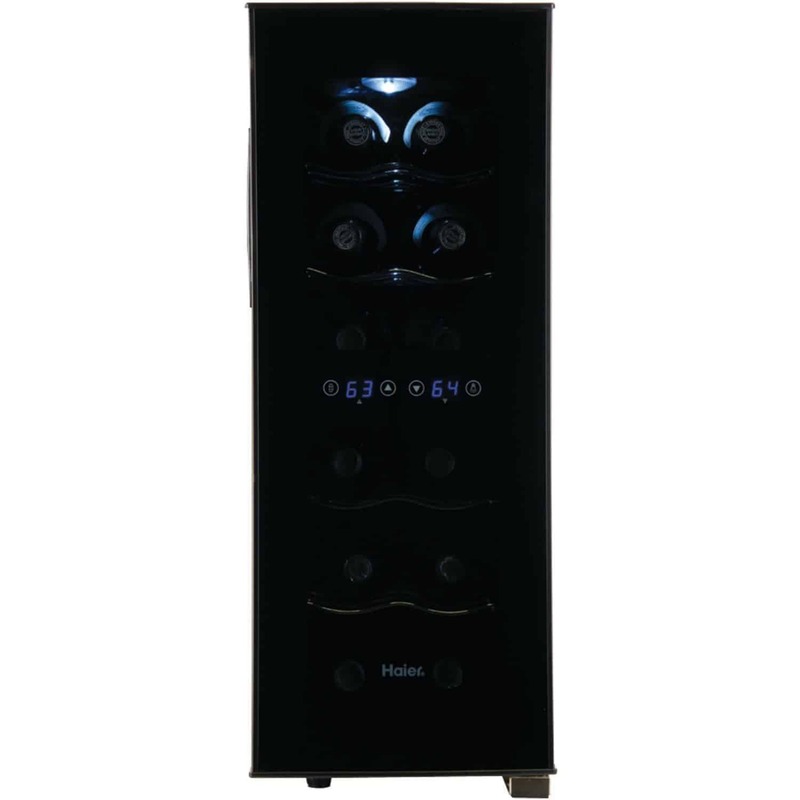 In fact, Haier manufactures small wine cellars suitable for 6 up to 18 bottles, but the 12-bottle wine cooler might be the right solution for the starters. With a beautiful design and a dual touchscreen display, this unit is perfect for the storage of both red and white wines in zones with temperatures that vary from 46 to 66°F and from 54 to 66°F. Thermoelectric cooler: you will not have to worry about noise and vibrations anymore, thanks to the thermoelectric technology. Modern design: the unit is black and has a dark tempered glass door that gives a lot of class and elegance. 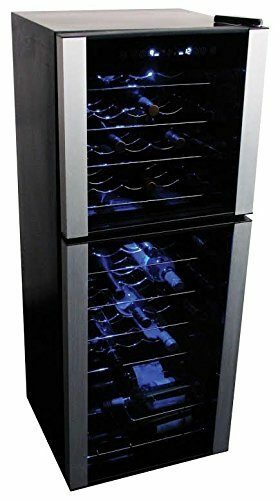 Excellent price: if you don’t want to invest a lot of money into a wine cooler, this unit comes at a great price. 5 size options: if you feel that a 12-bottle wine cooler is not right for you, you can just choose another size from the other four sizes available. Although this is a thermoelectric wine cooler, some users complained about the noise level. The last dual zone wine cooler on our list is the Koldfront 18 Bottle Free Standing Dual Zone Wine Cooler, a unit designed to hold up to 18 bottles. Like most thermoelectric coolers, the Koldfront unit has the temperature varying between 46 and 66°F in the lower zone and between 54 and 66°F in the upper zone. The contemporary design fits perfectly even in the most classical interiors thanks to the steel details and to the beautiful wooden storage racks. The temperature is controlled by a digital display and the tempered glass door is provided with a convenient safety lock. Convenient shelves: the storage racks slide out easily, allowing a quick access to your favorite wine. Accurate temperature settings: the unit is able to maintain the set temperature, which is great for a thermoelectric unit. Silent operation: this unit runs very silently, and the level of vibrations is almost zero. Safety lock: if you want to keep your children away from your precious collection, the safety lock will be very handy. The 18-bottle capacity refers to standard Bordeaux bottles, so if you want to store larger bottles the capacity will diminish. According to us, the best dual zone wine cooler available on the market is the Kalamera 157 Bottle Freestanding Wine Refrigerator. This unit is ideal for both wine enthusiasts and winemakers who don’t have access to a regular cellar, allowing you to store up to 157 bottles at the same time. If you don’t need so much space, there are available some smaller versions. Being a compressor wine cooler, the unit will not have any issues in maintaining the set temperature, and you can choose to preserve, or just chill the wines, according to your needs. The unit looks surprisingly good on its own, but you can also choose to include it in your furniture, so this is another big plus. Like any other product available on the market, the Kalamera dual zone wine cooler might have some flaws, but the reliable technology and its excellent characteristics make it the best dual zone wine cooler you can buy.